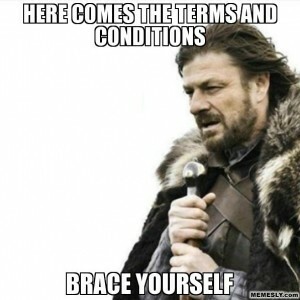 I’m going to admit that I do not read the Terms & Conditions for most things. I am also going to assume that most of my friends do not either. Why?! 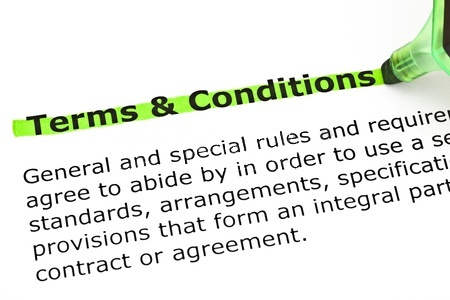 Terms & Conditions seem to be the last little step that you have to get through in order to participate on a social networking site or the last thing in an office that is holding you up from completing your purchase. It’s torture. It’s like dangling a treat in front of a dog and fully expecting the dog to sit there patiently until you give it to them. Maybe some dogs can do that, but smart dogs know that they can have that treat if they just jump up and take it. Case in point, having patience is a virtue that many of us do not practice enough when it comes to reading over what we are agreeing to. But, is what we are agreeing to always ethical? That’s a hard question to answer–depending on which side you are standing on. Jumping up and grabbing that treat probably is not always the smartest thing. I’m going to use Vine as an example. Below I will list different pieces of information taken straight from Vine’s Terms & Conditions page and then attempt to translate them or explain my thoughts on them. * You are responsible for any consequences that arise due to something you have posted. This seems standard. You are responsible for what you post, so you are being held accountable. Essentially, you are agreeing to terms that you have to abide by even when you do not know what they are…. yet. If Vine decides they want to sell your content, they can do so without giving you prior notice. Does that seem fair? Not really. How can you really agree to terms that may change without any notification?! * Vine cannot be held liable if someone hacks your account because you have a weak password. This seems fair. Vine suggests that you should use a mixture of lowercase and capitol letters along with numbers to make a strong password combination. They are giving you the “how to,” tools so it is up to the user to fulfill the obligation. As they stated above, Vine is not responsible for what users post. BUT, here is says they may or may not monitor the content that is posted. This means that sensitive material can be uploaded by users and Vine is not obligated to monitor or control it. So if something that is very hateful toward a person or group is posted, Vine may not do anything to prevent it from spreading? To me, this seems wrong because unethical and dangerous content may need to be flagged and removed in a very timely manner. Okay, Vine, we get it. You do not want to be responsible for any content users post. However, as a platform is it ethical to allow users to post content that is dangerous or offensive? * Each user owns the rights to the content that they post. By posting, you are forgetting all royalties that could be collected and giving Vine the ability to use your content (with the ability to edit it) anywhere they please. * Vine has the ability to alter your content when they use it or distribute it to third parties and in different mediums. You are responsible for any issues that arise out of Vine’s distribution of your content (edited or unedited). That seems very unethical to me. Vine can alter something that you create and disseminate it in additional ways, yet you are still responsible for their edits. Above, we saw how Vine did not want the responsibility of monitoring content, but now they are stating they have the right to remove content. I would like to see how they identify the content they would like removed if they do not feel the obligation to always monitor what is posted. * Vine is allowed to remove content that appears to be copyrighted. That seems fair. They have stated that all content must be original and be your own. * If you happen to check the Terms & Conditions for Vine and notice they have been updated–and you do not agree to something from the newly updated T&C, you are able to close your account. 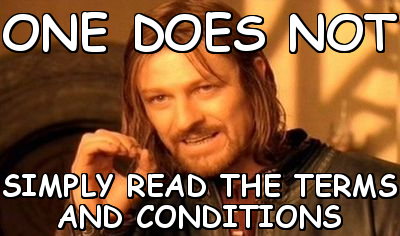 That is fair, BUT it is not fair to not be alerted that the T&C have changed. We have been taught that social media is driven by the visual aspect, so why can’t these social networking platforms amplify the tiny print into something like a video or info graphic that is more user friendly? Me, personally, I would be more likely to watch a quick video than I would be to read over something tedious. 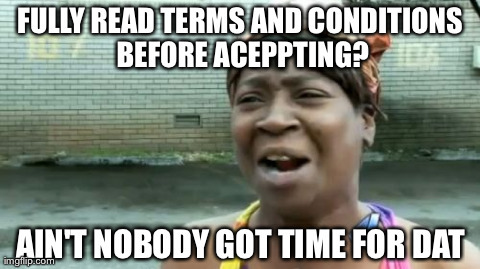 Some of our internet comrades are quick to admit that they do not read the T&Cs. It appears many of us feel the same way. It is probably worthwhile for different social networks to listen to their users and create documents that are easier to read. Since the idea is to be social, wouldn’t it be fun to have some user-generated content to use as highlights in the different sections of Terms & Conditions? If it will entertain me, I will watch it. 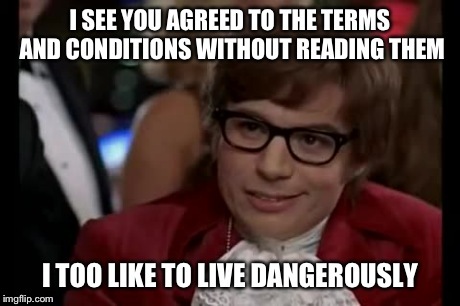 What are your thoughts on Terms & Conditions?